Original title Merry Christmas later changed to White Christmas. When Decca (and the rest of the industry) abandoned the 10-inch LP format in 1955, it created a 12-inch LP version of Merry Christmas, catalogue Decca DL-8128, with four additional songs and the now familiar cover with Crosby in his Santa Claus stocking cap as pictured above. The new songs were "Silver Bells" and "Mele Kalikimaka," both recorded in September 1950, and "It's Beginning to Look a Lot Like Christmas" and "Christmas in Killarney," both recorded on October 1, 1951. The album's track listing was also adjusted slightly, with "Faith of Our Fathers" now preceding "I'll Be Home for Christmas." This issue has remained unchanged to present; first pressings of the album were released on Decca's all-black label with the catalog number in the top left corner of the front cover. In 1963 the album was made available in electronically re-channeled stereo (with Decca's moniker, "Enhanced for Stereo" added on the upper right corner of the cover), Decca DL-78128. Mono copies made after the introduction of stereo have "DL-8128" in the bottom left corner of the front cover. All copies from the 1960s feature the Decca rainbow label. The mono version was temporarily deleted in 1968. The re-channeled stereo mixes are considered by many to be inferior due to the addition of artificial reverb, giving the once intimate-sounding "dry" original masters a "concert-hall" sound. The reverb is particularly intrusive on tracks such as "Adeste Fideles", "White Christmas", and "Silver Bells." In 1973, after MCA merged all their labels (Decca, Uni, Kapp) to one corporate name, MCA Records, the album received a new catalogue number, MCA 167. This version was only available for a short time. Eventually, MCA chose to create a new numbering series for its reissued Christmas albums, and Merry Christmas was assigned MCA 15024. This exists on the black with rainbow, tan, and blue with rainbow labels. While the initial MCA pressings were in re-channeled stereo (as on the post-1963 Decca issues), the original "dry" mono mixes were restored to several of the later MCA pressings- most notably on the blue with rainbow labels. In 1986 Merry Christmas was transferred to compact disc, MCAD-31143 and included these same twelve songs in their original mono mixes. 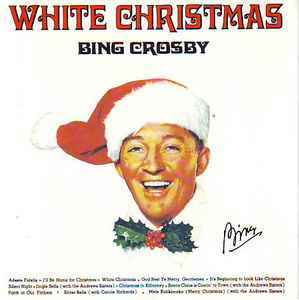 Universal Music Group (successor to MCA Records) changed the name of the album to White Christmas, keeping the contents and the catalogue number unchanged. A new mono re-master was made in 1992 and reissued in 1995 (with either Catalog #MCAD 20820, or Catalog #MCAD 31143), and again in 1998 (with Catalog #B0017220-02), which is the one available at present. Is this not the same version as Bing Crosby - Merry Christmas, just with new matrix? Merge them? I have the MCA (MCA-15024) version which appears to be mono. I doesn't seem to get more 1940's - 1050's American than this! MCA did a great job on this! Helps that my copy has not a scratch or pop on it! The white/red split limited edition has superior sound and mastering. It perhaps one of the quintessential American Christmas albums. This album alone can set the mood for anyone's holiday festivities. Quite possibly the best Christmas album ever. This is my desert island disk if I ever get stranded on Christmas Island! Records I got in 2018 by EllieF.